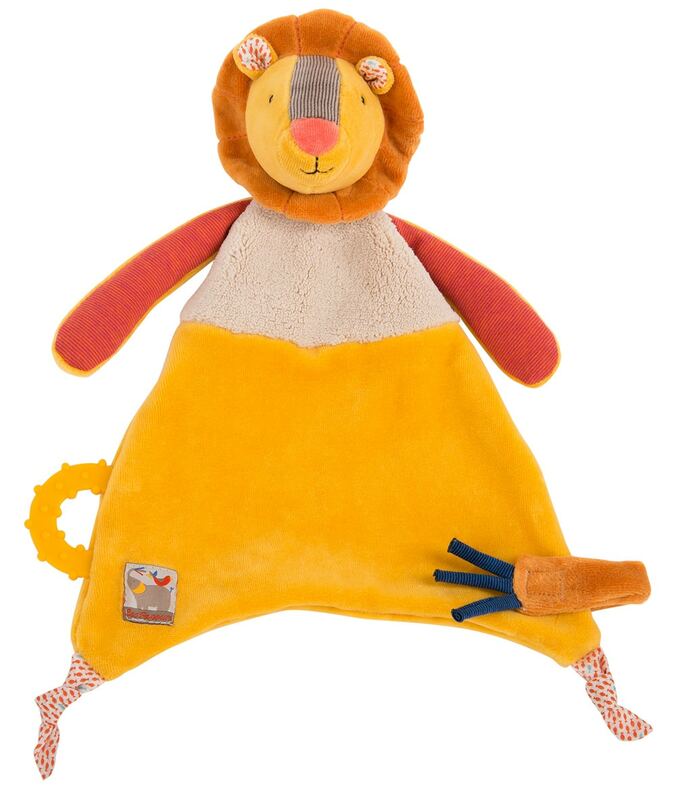 The lion comforter with teething ring from Moulin Roty’s new ‘Les Papoum’ range would be lovely for either a girl or a boy. The teething ring is stitched into the ‘blanket’ body component of the comforter and the comforter also comes with a strap to keep baby’s pacifier close at hand (the strap is fastened with velcro). The Lion comforter is made from a variety of fabrics – velour, super soft and spongy terry velvet with touches of cotton, jersey and corduroy. Lion’s mane is backed with a patterned cotton and on the 2 bottom corners of the comforter blanket is a crisp piece of knotted cotton – perfect for little fingers to play with. ‘Les Papoum’ range was introduced by Moulin Roty mid 2015 and centres around 3 main characters – the hippo, the lion and the elephant. The range draws its inspiration from a Savannah that is lush with watering holes, rich vegetation and gentle breezes. Earthy neutral colour tones highlighted with warm ochre yellow, saffron and coral make it a range that will suit either a girl or a boy.